I have something to really tempt you with today. 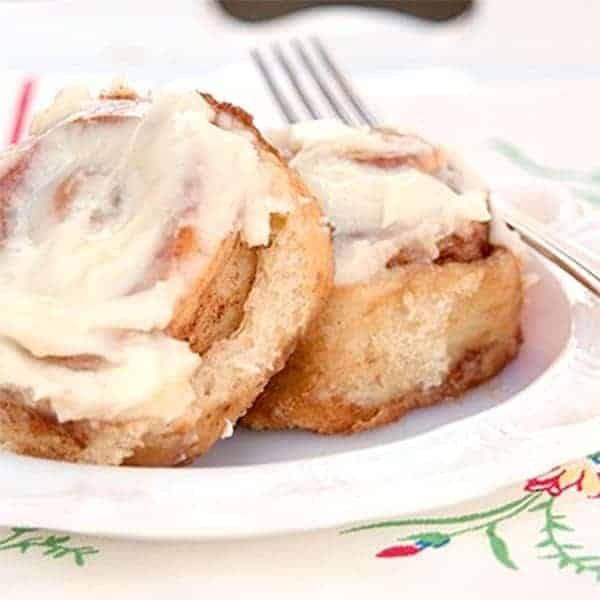 Fresh hot Cinnamon Rolls warm from the oven slathered with rich cream cheese icing. Ahhh…. Who can resist that? If you’re currently on a diet, I apologize in advance. Maybe you could file this post for future reference. Or maybe you could make a pan full of these, have one for yourself and share the rest with your neighbors. On second thought, maybe not. They’d be permanently camped out in your kitchen waiting for the next batch. They’re just that good. One of the greatest pleasures of the kitchen for me is working with yeast doughs. In years past I made bread nearly every weekend. I love the whole process – the kneading and the rising. The way the dough feels in your hands and the way it grows while resting – almost like the dough is alive. There’s also something calming and restful about it. Working the dough gives your hands and arms a good workout and gives time for your mind to wander. It’s been a little while since I worked with a yeast dough and I was really starting to miss it. I wanted to make an old tried-and-true cinnamon roll recipe that I used to bake about twice a month. It was a recipe that I found on the internet way, way back. But, sadly, I couldn’t find that recipe anywhere! Never fear though, this one adapted from the King Arthur Flour web site is just as good, if not better, than my old standby. Combine all the ingredients for the dough in a large mixing bowl (or the bowl of a stand mixer). Stir until the mixture begins to come together (see above – it will look pretty “shaggy” at this point and that’s okay). To knead by hand, transfer the dough to a lightly oiled work surface and knead for 5-8 minutes or until smooth. 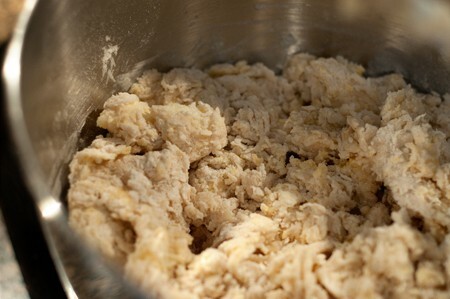 To knead in a stand mixer, attach the dough hook and knead for 4-7 minutes at medium speed. Place the dough in a lightly oiled bowl, turning it to grease all sides. 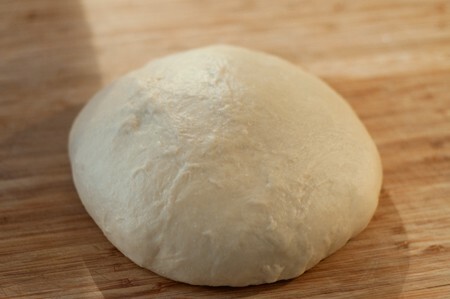 Cover the dough with plastic wrap and let it rise in a warm place for 60 minutes or until doubled in size. Note: I find that my granite countertops are too cool for dough to rise correctly so I put the bowl in the oven with the light on. It’s just cozy enough in there for the rising to take place. Punch down the dough. Transfer to a lightly greased surface (I just sprayed a little cooking spray on my countertop) and roll into a 16×21 inch rectangle. Leaving a 1-inch border at one of the short ends, spread the dough evenly with the 1/3 cup softened butter. 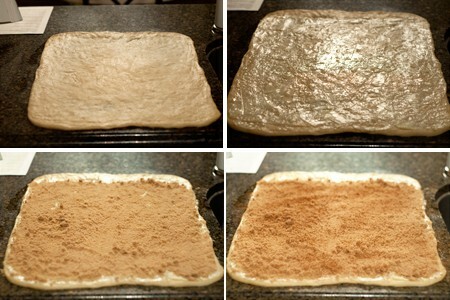 Sprinkle the brown sugar and cinnamon evenly over the buttered area of the dough. Be sure to carry the filling all the way out to the edges except on the one-inch border. Starting at the opposite end from the clean one-inch border, roll the dough into a log. Pinch the end all the way across the log to seal the dough. Cut the dough into 12 equal slices and place the buns in a lightly greased 9×13 pan. Cover the pan with plastic wrap and let the buns rise for about 30 minutes or until nearly doubled. While the buns are rising, preheat the oven to 400 degrees. Bake until golden brown, about 15 minutes. While the buns are baking, make the icing. 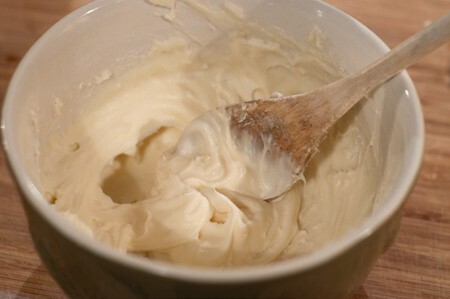 In a small bowl, beat together the cream cheese, butter, sugar, and vanilla. When the buns are golden brown, remove from the oven and allow to cool for 5-10 minutes. 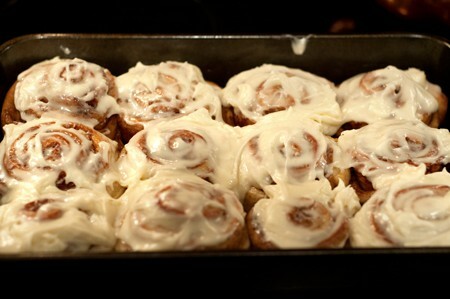 Homemade cinnamon rolls warm from the oven slathered with cream cheese icing. Combine all ingredients for the dough in a large mixing bowl (or the bowl of a stand mixer). Stir until the mixture begins to come together. To knead by hand, transfer the dough to a lightly oiled work surface and knead for 5-8 minutes or until smooth. To knead in the stand mixer, attach the dough hook and knead for 4-7 minutes at medium speed. Place the dough in a lightly oiled bowl, turn over once to grease all sides. Cover the dough with plastic wrap and let it rise for 60 minutes or until doubled in size. Punch down the dough. Transfer to a lightly greased surface and roll into a 16x21 inch rectangle. Leaving a 1-inch border at one of the short ends, spread the dough evenly with the 1/3 cup softened butter. 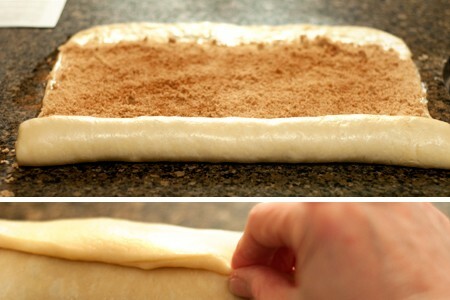 Sprinkle the brown sugar and cinnamon evenly over the buttered area of the dough. Be sure to carry the filling all the way out to the edges except on the one-inch border. Starting at the opposite end from the clean one-inch border, roll the dough into a log. Cut into 12 equal slices and place the buns in a lightly greased 9x13 pan. Cover the pan with plastic wrap and let the buns rise for about 30 minutes or until nearly doubled. While the buns are rising, preheat the oven to 400 degrees. These are whimsical Lana… ever so pretty! Love love love the frosting! You know I’d send you some if I could! Give them a try – you’ll really love these. Well, then it’s high time to make some again! I’ll bet the folks at your office will really enjoy these. They’re beautiful! I can eat this morning, noon & night! I want one. Will you save one for me? They are so beautiful and perfect! And I am sure they taste wonderful! They did turn out very well. It was so nice to be working with a yeast dough again. I had really missed it! Ughhh…now I’m going to make these tonight. 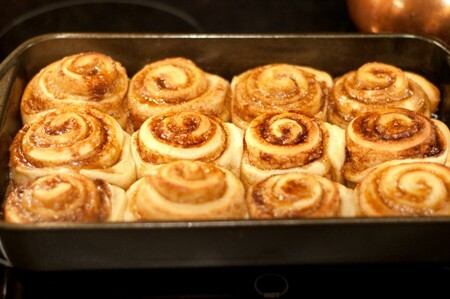 I’ve been dreaming of cinnamon rolls for quite some time now and just the sight of these have convinced me to bake a pan. And yes I AM on a diet! Sorry to tempt you, Jehan! Just have one and take the rest to work or to your neighbors. They’ll love you for it! I can do a lot of things and cook a lot of foodstuff, working with yeast is not one of my better qualities… but I would love to give this one a go.. Working yeast doughs is one of the things I enjoy the most, Drick. Something so pleasurable about the kneading and rising. I’ve got to do it more often! Also, Drick, this is a very forgiving dough. You can leave it to rise too long and it doesn’t care at all. In the interest of full disclosure I’m going to tell you that I actually forgot that it was rising in the oven while I cooked supper and by the time I remembered it had been in there about 2 1/2 hours. I still punched it down and went right on with the recipe. It was so relaxed that I didn’t even have to roll it out, just pressed it into a rectangle with my hands. Still turned out fantastic! These just look sinfully good!!! I am definitely going to have to make these soon. I came across your site tonight and am so glad I did. I also grew up in the South and some of your recipes take me back to my momma’s cooking. I’m looking forward to trying some of your wonderful dishes. Thank you, Lyle. So glad you enjoy it! These look perfect! Love the photo too! Gosh-I don’t have cabinet space to make these at my house-can you just make them and send them to me?? Haha!! These look SO good! Morgan – I’ve had so many people here and on Twitter ask me to send those buns to them, maybe I should start a mail order business! Hark!! My tummy is grumbling!! Sophia – You could make up a batch this weekend. It’s a really easy recipe and an easy dough to work with. I really wish I had these in my kitchen right now! Ohhhhhh! Amazing! I have that same plate too, only in large size! :) stumbled and pinned! Thanks, Amanda! I’ve got to take time to look at Pinterest. I’m seeing a lot about it on Twitter lately. I love your sweet rolls. They look so appetizing. can i substitute active dry yeast for the rapid rise? Yes, but it will lengthen the rising time. Hey Lana, if I wanted to make these fresh for breakfast can you leave them to rise overnight? I don’t want to get up at the crack of dawn to make them! Hi Heather! I’m not sure about the overnight rise. Maybe if the dough was refrigerated, but a regular rise overnight would probably be too long. If I wanted to serve these for breakfast, I’d probably bake them a day or two before and then reheat and put the icing on the morning I was serving. I stumbled across this recipe and loved how precise your directions were! Loved the pictures as well. I added walnuts and raisins to the recipe and it came out perfect! Definitely going to use this as my go-to recipe! Thank you so much! Thanks, Mercedes! I’ll be the raisins and walnuts were really great in this! I love this recipe but I do have a question. I plan to make a batch to leave for family to have during the week for breakfast while I am away. We like our cinamon rolls warm. Should I leave the baked rolls in the fridge unfrosted and then warm and frost individually or will they become too hard? 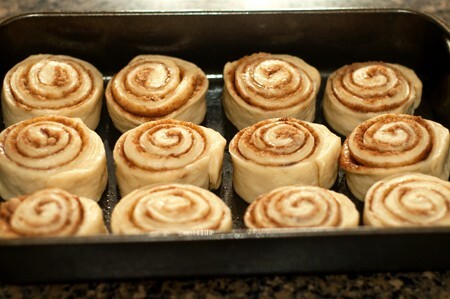 Is it better to frost them all at once and just reheat in microwave? I just made these and they didn’t turn out very well, they didnt rise very much and turned out super dense. What did I do wrong?! It sounds like a problem with the yeast. Either it was past its expiration date or you got the liquid too warm and killed it. So sorry you had a problem with the recipe. It’s a great one that always turns out for me and I hope you’ll try again. I too want to thank you for the step by step pictures with the recipe. My boys love cinnamon rolls so I used to cheat and buy store brand. Came across recipe and made them. Not only did my boys love them, they will no longer eat store brand ones. Thank you again. Thank you so much for sharing this recipe; my daughters and I made these today and they were awesome (we added raisins too )! Hi I have never used yeast before and I wanted to know how much is in a packet of yeast so I don’t get the wrong one. Thank you they look so good and I want to make them for my family Christmas morning! Miranda – it’s 1/4 ounce per packet.